I am primarily a text-driven composer in a Western classical art-music zone. I love the process of converting naked text into something acoustically meaningful, and am attracted to themes of social conscience. Since arriving in Australia from New Zealand in 1983, Dennis Vaughan has had an extensive and varied involvement in Melbourne's music circles as an orchestral and recital musician, composer, arranger and teacher. His performance career has covered work with symphony and chamber orchestras as well as recital, recording and session work. 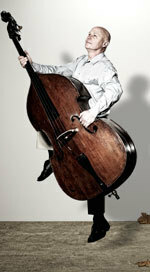 He is currently Associate Principal Double Bass with Orchestra Victoria. As a composer and arranger, Vaughan has a particular interest in theatre works, and most of his compositions and arrangements involve musical settings of text. His ability to produce works that are accessible to performers and audience has resulted in numerous commissions over the last twenty years from a diverse range of arts, community and educational institutions. Recent works include Two Songs From Black Australia for oboe, harp, and soprano, an opera, The Tell-Tale Heart, which was premiered at the 2005 Castlemaine Festival, and a string quartet for the 2005 Lyrebird Award for the British Music Society.